Every year, the Scottish Government publishes the “Scottish Fish Farm Production Survey”. 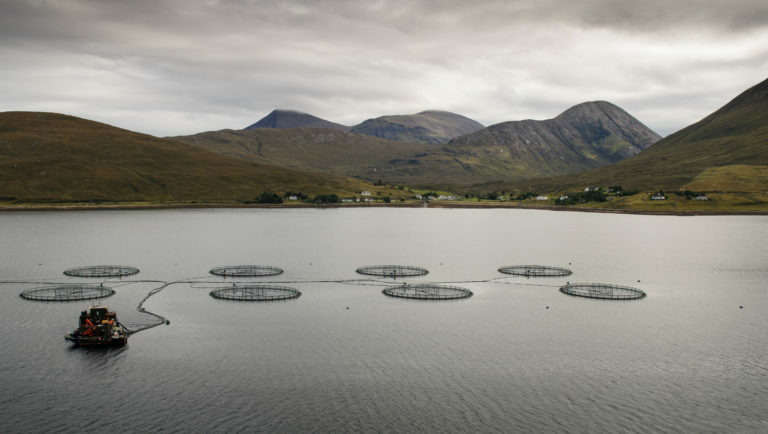 These reports shed light on things such as the number of active salmon farming sites, the number of fish entering sea-water salmon farms in Scotland, survival rates of salmon throughout the production cycle, and information on cleaner fish. In 2017, 36.7 million individual fish (189,707 tonnes) were produced by 226 active salmon farms. 45.5 million young salmon (smolts) were put into seawater farms in 2015, and of these, 20.9% (9.5 million) died during the two-year production cycle. As we pointed out in our report on the welfare status of Scottish salmon farms and companies in 2017, mortality rates differ between companies, farms, and also location. The production survey report shows that, mortality rates of smolts put to sea in 2015 were highest in the Western Isles, and lowest in Orkney (Table 1). In the Western Isles, of the 13 million salmon put to sea, 4 million (30.3%) died during the production cycle. Lumpsuckers are used as cleaner fish to pick off sea lice from salmon. Their production increased by 35% compared to the previous year. This is compared to the production of wrasse (another type of cleaner fish) which decreased by over half from 118,000 individuals in 2016 to 58,000 in 2017. There are welfare concerns over the use of both lumpsuckers and wrasse, including aggressive interactions, disease, and is not known how many cleaner fish survive the full production cycle. Escaped salmon are less likely to survive, as they are no longer well adapted to life in the wild. However, despite this there is evidence that salmon can interbreed with wild individuals, which can negatively impact wild populations by producing offspring with reduced fitness. Overall, the production report provides a good insight into the state of Scottish salmon farming in 2017. Here at OneKind, we believe that a mortality rate of 20% across the production cycle, escapes of 30,009 salmon, and the use of cleaner fish despite limited knowledge about their biology and welfare in captivity, is not acceptable. That is why we are calling for a moratorium on the salmon farming industry’s plans to expand to nearly double the level of production by 2030. If you agree, please sign our petition now! Something doesn’t seem right here! If I ran a business with a 20% loss built in, I’d be out of business! I wish someone could explain.